Today we will be making pitch riser effect in FM8. This effect is mainly used in transitions between parts of almost any electronic dance music genre. It ranges from simple sine wave pitch risers to more complex sound effects. Operator F will act as our main carrier. In order to the pitch sweep in operator’s frequency we must use pitch envelope of the FM8. Note that this Pitch envelope is a bit different from all the others in FM8 since it is bipolar. It can modulate from negative to positive values. In order for pitch envelope to affect the pitch of any operator you need activate this Pitch Env button found in every operator’s page. Also in the pitch envelope page of the synth you have global Pitch Envelope amount control which globally controls how much are any of the operators with activated Picth Env button affected by it. Turn global picth envelope modulation amount control to it’s fullest value. 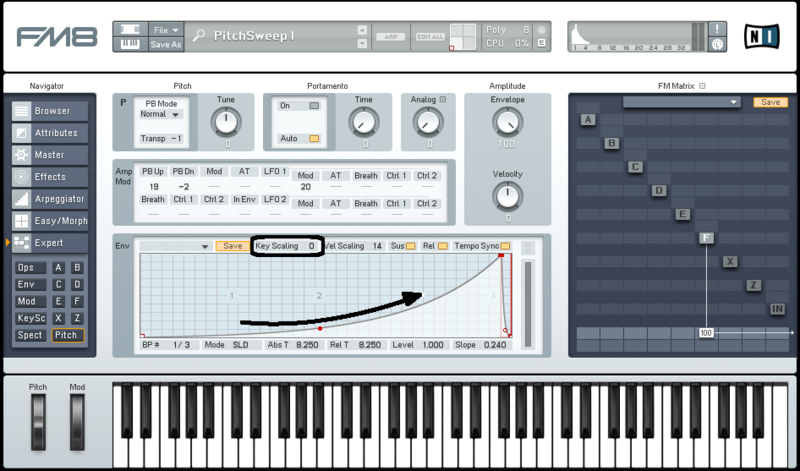 Create a 4 bar long rising pitch envelope and a midi note of the same length in your midi track. Be sure that the key scaling parameter of the pitch envelope is set to 0 so the length of the pitch envelope will always stay the same length regardless of the note you play. Change the envelope’s slope to convex shape. Go to the operator F control page and adjust it’s amplitude envelope to rise over 4 bar also, but in linear fashion. Optionally you can add a short fadeout at the end of amplitude envelope to ease the transition and to avoid clicks. Now to add some interest to it we will activate the operator E to modulate operator F.
Activate the operator E and set the modulation amount for operator F to 66. You can hear some more interesting bass frequencies now also it doesn’t sound like a simple pitch bended sine wave anymore but it also has some harmonics in it. To further pronounce this effect let’s activate operator D to modulate operator E. Set the modulation amount to 66 also. This is a bit more interesting now but still, let’s add another modulator for operator D. Activate the operator C and set it to same modulation amount as we did with others. Still not enough? So lets add another modulator to modulate operator C. Use the same modulation amount for operator B to modulate operator C.
Yes, you have guessed right, also enable operator A and set it to modulate operator B with the same amount. By now you should hear a very noisy pitch riser. We should lower all the modulation amounts to 40 so we get a bit cleaner sound. Also note that if you want your pitch sweep to start from the same note you are playing, you should set pitch envelope to start from zero and sweep only trough positive values, like in the picture below. The modulation amounts don’t have to be the same, experiment with changing them to their own unique values. Also we can change the operator’s F waveform to 1+8 shape. And also the operator’s E waveform to something like 1+2 shape. Try also changing the pitch envelope to rise with a more concave slope. This produces a bit different interesting effect. The next step can be changing the each operator’s envelopes we haven’t set yet to some more interesting shapes. The easiest way to do this is to go in the Envelope page of the FM8 and there you can see all the envelopes at once. First, sync all of them to host tempo. I also recommend you chose Mode:Fix option in the envelope control bar so you’ll be able to edit all envelopes without changing their overall length which we want to stay exactly the same- 4 bars. Once you have synced all envelopes, set any envelope over four bar length and then double click in the empty background of that envelope display. This will snap the view of all envelopes and fit them in exactly four bars long view region. So now it’s really easy to edit them all. Draw various shapes, create new breakpoints, make envelope rise and fall over four bars etc. There are no rules really, just listen on how it affects sound. Also we could change operator’s ratios. I recommend you don’t change operator’s F ratio for now, so we will preserve fundamental pitch of the note. Start rather by changing operator’s A-E ratios first. Effect will be very different if you just slightly de-tune operator’s ratio or if you change it drastically. You can also change waveforms of the operator’s but that will probably introduce more noise so you should maybe lower the modulation amounts if you do that. Whenever you feel your sound is to noisy first check all the modulation amounts and lower them if needed. Another cool thing to do is to deactivate certain Pitch Env buttons in some of the modulating operators, so the pitch envelope wont affect them anymore. This way you can create some unique sounds. Again, no specific tips which one to deactivate just experiment and listen. Also you should use some EQ and some reverb and stereo spread. Here are my settings but you could be much more generous with it’s amounts. Next time we will be creating some bass dive bombs.